Editor’s Note: This article is based on research presented during scientific press conferences at the SNM annual meeting in San Antonio in June. PET may be available as an effective method for the early detection of Alzheimer’s disease within a few years, according to research discussed at SNM’s annual meeting. The work is providing new insights into the development of Alzheimer’s disease, potentially opening the door to future clinical screening and treatments. Molecular imaging of Alzheimer’s disease is focused on detecting and analyzing the formation of a naturally occurring protein in the brain called beta-amyloid, which researchers now say is directly involved in the pathology of Alzheimer’s. Researchers are also looking at the possibilities involving amyloid-associated therapies and vaccines. They note that the beginning stages of the disease can precede symptoms of dementia by a decade or more. Imaging patients when they first show signs of mild cognitive impairment could prove important for determining their risk of future disease. Beta-amyloid accumulates as neurotoxic plaque preceding the onset of Alzheimer’s disease and as a result, extensive neural tissues that control major mental and physical functioning, including memory, language, and motor function, are decimated. In time, the disease becomes debilitating and has a devastating impact on individuals’ quality of life. Three ongoing studies presented at this year’s meeting involve several years of research based on hundreds of participants ranging widely in age, cognitive ability, and stage of disease. Results of these studies showed that amyloid plaques build up very slowly and that they are often already present in healthy older individuals—12% of those in their 60s, 30% of those in their 70s, and 55% in those over the age of 80. In one study, about 25% of subjects over the age of 60 had amyloid plaques. The presence of significant amyloid buildup is linked to quicker memory decline and brain atrophy. One of the major questions in Alzheimer’s imaging has been which imaging agent is best for amyloid plaque screening. Several studies have been conducted using 11C Pittsburgh Compound-B, a PET imaging agent that binds to beta-amyloid in neural tissues, but two of the current studies are gauging the benefit of using F-18 labeled tracers (F-18 Florbetaben and F-18 Florbetapir), designed for routine clinical use. Both F-18 Florbetaben and F-18 Florbetapir are proving to be good predictors of progression to Alzheimer’s disease, and F-18 amyloid imaging agents are the likeliest agents to move forward into clinical practice in the near future. SNM’s 2011 Image of the Year illustrates the ability of PET/CT scans to identify abnormal bone reaction in patients who have received spinal fixation hardware implants. Researchers selected this image from more than 1,800 studies presented at SNM’s 58th Annual Meeting in San Antonio. The Image of the Year exemplifies the most cutting-edge molecular imaging research today and demonstrates the ability of molecular imaging to detect and diagnose disease and aid doctors in selecting the most appropriate therapy. 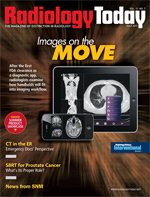 “This year’s image demonstrates the clinical utility of PET/CT using the newly approved PET F-18 sodium fluoride [NaF] bone imaging agent to correctly pinpoint the cause of recurrent pain after surgical placement of spinal fixation hardware,” said Peter Herscovitch, MD, chair of SNM’s Scientific Program Committee. Serious spinal instability and disease often necessitate the implantation of hardware such as plates, cages, rods and screws, or bone grafts to support the spine. There are many reasons patients experience pain after initial surgery, including hardware failure, infection, or both. Determining the source of such pain can be difficult, especially when patients have complex medical histories. In this study, a combination of PET/CT and F-18 NaF, an injected radiotracer that uses NaF to target areas of high bone turnover and inflammation during imaging, was used to evaluate patients with back pain after spinal surgery. This form of molecular imaging was shown to be highly accurate in determining the culprit of a patient’s chronic pain by highlighting both the structure of the bone and the physiological processes involved in inflammation, an indication of injury and infection. A study using PET to image the heart’s oxygen usage may help determine the cause of and expand treatment for a genetic heart disease called hypertrophic cardiomyopathy (HCM), according to research presented at SNM’s annual meeting. HCM is a cardiovascular disorder that causes thickening of the heart muscle. The study suggests that a genetic mutation may be an important key to understanding the disease. HCM can cause sudden cardiac death at any age, and the pathophysiology is not well understood. However, preclinical research points toward genetic mutations, such as MYBPC3, which are exclusive proteins in the heart’s contractile tissue. In one study, researchers imaged 16 subjects with the MYBPC3 mutation using PET to image the heart’s oxygen usage. This was coupled with cardiovascular MRI to gauge the heart’s ability to use energy efficiently. To their surprise, patients carrying the MYBPC3 mutation were shown to have less efficient hearts even prior to the thickening and subsequent symptoms associated with HCM, which makes it a prime causal candidate for the development of the disease. For HCM patients who remain symptomatic despite medication, alcohol septal ablation is a popular treatment. It is essentially a miniature, controlled heart attack triggered by an absolute alcohol solution administered to the septal artery that provides blood flow to the thickened heart muscle. Interventional cardiologists perform the noninvasive therapy using wires and balloons guided to the artery. There are few complications associated with the procedure, and it is the preferred treatment over open-heart surgery. Simultaneous PET/MRI can provide important diagnostic information about soft tissues and physiological functions throughout the body as well as reduce the radiation dose associated with the exam. The hybrid modality could lead to the clinical use of PET/MRI as an additional tool for detecting cancer and other diseases, according to new research discussed at the SNM annual meeting. PET/CT is the most commonly used hybrid imaging, but MRI offers some potential advantages for combination with PET when compared with CT. MRI offers better soft tissue contrast. CT images of certain areas of the body—including the brain, head and neck, and pelvis—provide restricted resolution of anatomical structures. MRI technology is excellent for imaging these complex areas of soft tissue and may provide answers to unresolved musculoskeletal questions. In combination with PET, MRI may also have value for imaging liver and breast tissues and would provide a useful tool for imaging children due to its reduced radiation dose. Simultaneous PET and MRI has been difficult because the magnetic field of MRI technology has limited PET, specifically the photomultipliers needed for data acquisition. The advent of “avalanche photodiodes” enabled the building of a fully integrated and whole-body PET/MRI prototype used in the current study. SPECT imaging with I-123 beta-methyl iodophenyl pentadecanoic acid (I-123 BMIPP) may provide a safer tool for cardiovascular disease screening in diabetic patients at risk for ischemic heart disease, according to research presented at SNM’s annual meeting. Ischemia of the myocardium can signal diminished oxygenation of the heart tissue and trigger a heart attack if left untreated. The study is the first to examine the detection of ischemic heart disease in diabetic patients without any history of myocardial disease. If moved into broad clinical use, the imaging tool could help physicians detect myocardial ischemia before major cardiac events and make clinical decisions that could save lives. According to the American Diabetes Association, approximately 25.8 million children and adults—more than 8% of the population—have diabetes and are at least twice as likely as those without diabetes to develop heart disease. The link is attributed to the damaging effects of high blood sugar levels on blood vessels, as persistently high blood sugar levels can lead to inflammatory disease and atherosclerosis and eventually myocardial ischemia. Standard myocardial perfusion imaging provides information about blood flow in the heart at rest and under stress either with exercise or with drugs that re-create the physiological changes associated with exercise. However, stress testing may be unsafe for patients at risk of complications or cardiac events. The I-123 BMIPP study explored a method of molecular imaging called myocardial fatty acid metabolism imaging, which may prove to be a safer alternative for patients suspected of having ischemic heart disease. In the study, 191 diabetic patients were injected with I-123 BMIPP, a medical isotope bound with an agent that is metabolized by the heart in order to image the fatty acid uptake of heart muscle cells. Once injected, patients were imaged using dual SPECT to capture both physiological and anatomical information about the body. The study’s objective was to test the predictive value of this imaging procedure for major cardiac events, such as a fatal heart attack, and minor cardiac events, such as hospitalization due to heart failure.